Red, green and white Festive Santa Claus Button Badge. This Christmas themed badge has Father Christmas in the centre and the text 'He's Making a List Checking it Twice written around the edge. 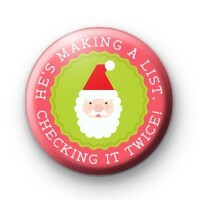 It is a fun festive badge to give out to kids or use as stocking fillers or give out at your Xmas Party. Our Christmas badges are also great to use in your festive crafts. We have a huge range of Christmas Badges so make sure you check out the Christmas category to see lots more designs.